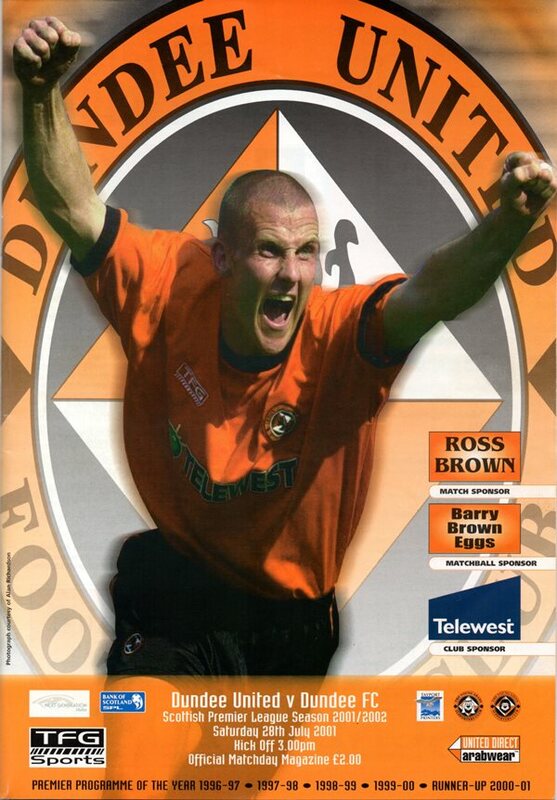 Dundee United faced Dundee at Tannadice on the opening day of the Scottish Premier League Season for the second time in three years. United manager Alex Smith opted to hand summer signing Jim McIntyre his debut whilst Ivano Bonetti named a strong Dundee lineup which featured three full internationals. With a sell-out crowd of over 13,000 in attendance, a minute’s silence was observed prior to the game in the memory of Tannadice legend Dennis Gillespie who had passed away in June. The Dark Blues kicked off season 2001/02 shooting down the slope towards the Arabs in the East Stand. United started brightly with Venetis making an early impact on the right hand side and in the fifth minute the young Greek had the game's first real attempt on goal, but his effort flew over the bar from around 20 yards. Due to the fast pace of the match both teams were struggling to impose themselves on the opposition. However there was a scare for United on 18 minutes when Juan Sara looked to get on the end of a dangerous through-ball but Gallacher anticipated well: rushing out to meet the Dundee striker and comfortably gathering the ball. One minute later there was another let-off for United. Marrocco found space on the left and fired in a shot that went only narrowly over. The Terrors were then handed the perfect chance to take the lead from the penalty spot on 20 minutes after Jim McIntyre had been upended in the box. Miller stepped up to take the penalty but crashed his effort off the bar to his frustration. However he didn't have to wait long to atone for that miss. With 29 minutes on the clock Partridge crossed the ball in from the left and Charlie Miller was on hand to prod home at the back post before celebrating joyously in front of the Dundee supporters. The away side hit back almost straight away: Juan Sara latching onto a kick-out downfield from Langfield, taking a touch to bring the ball under control before firing it across Paul Gallacher and into his bottom right hand corner, silencing the home fans and sending the Dundee fans into raptures. Both teams were playing well going into the half time break meaning that it was impossible to call which way the match would go. Neither side made any substitutions at half time but United seemed to realize that they would have to make more of an impact in the second half should they want to take all three points from the match. They almost got off to the perfect start when Buchan's shot on 46 minutes flashed inches wide of the target. Alex Smith's side were enjoying their best spell of the game so far but it was Dundee who took the lead against the run of play. Romano hoisted the ball high into the box from out wide on the right, Sara nodded it down into the path of Gavin Rae who was arriving unmarked at the back post to slot home. United made their first change on 61 minutes with Paterson replacing Venetis. Which was followed five minutes later with the substitution of Jim Hamilton in place of Jim McIntyre. 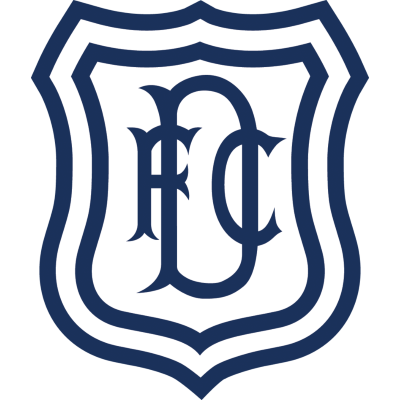 Roared on by the home fans, United were now throwing everything they could at the Dundee defence in the hope that they would be able to find an equalising goal. Paterson did well on 74 minutes to skip past a couple of challenges on the left, delivering a dangerous cross which was headed over by Hamilton. Now finding himself increasingly crowded out by dark blue shirts, Alex Smith withdrew Charlie Miller from the action to be replaced by Steven Thompson: United's last throw of the dice. With time ticking away and scoring opportunities few and far between for the Tangerines, it looked like Dundee were headed for their third derby win in four. That was until Jim Hamilton popped up deep into stoppage time to bullet home a Jim Paterson corner - sparking sheer pandemonium on and off the pitch with fans spilling onto the park in wild celebration. That proved to be the last action of the game as the referee called time on what had been a thrilling contest between the two sides.